We arrived early on Good Friday to get Nimrod ready for the season. It was certainly warmer than the UK at around 12 degrees C but it was also overcast and windy. We touched down at 11am local time having been up at 5 to catch our flight. The journey from the airport was easy and cheap at €1 each so by 1pm we were sitting in our favourite focacceria for lunch. Nimrod was looking good so we started on our list of maintenance jobs with Liz managed to sort the gas by taking everything apart and reassembling it! We also emptied and refilled the water tanks as we had sanitised them with Milton solution before leaving the boat in December. However, mid way through the second emptying the water pump decided to stop working. Luckily, we had a spare pump on board so decided to fit it on Saturday morning as it was getting dark and we wanted to watch the Processione del Discendimento. This is a procession through the old town of Christ’s death bed, that appears to involve most of the town as several hundred people were involved. They had covered the lights with red veils to add to the atmosphere. 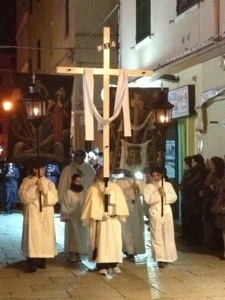 After the procession we went to our favourite restaurant in Alghero, Pesce D’Oro. Saturday began very windy with a mistral building so most of our maintenance jobs were indoors although we needed to fit the new water pump. After we had fitted it, it stopped after about 5 mins. We weren’t sure what the problem was but we needed to go shopping as everything closes for Easter. It also started raining so we went below and continued our jobs. We have a foot pump for the water so we knew we could still have water coming through. We decided to eat out to eat at King’s Restaurant on Sat evening and had a fabulous crab linguine. The crab doesn’t come dressed so it was a messy affair but well worth it. The clocks go forward on the last Sunday in March so we lost an hour’s sleep but the weather was sunny and much warmer at around 18 degrees so it was a delight to start work on the outside of the boat. We sorted the problem with the water pump by increasing the pressure in the accumulator tank with a bicycle pump. We also cleaned the chrome and put the genoa sail back on, ran the engine and the outboard so that we are pretty much ready to go when we come back. We ate on board and had the local pasta dish – fregola – which is made from wheat. It felt very satisfying to get so many jobs done. Our flight on Monday is at midday so we won’t get much done apart from putting the boat to bed until the next time. All in all, a lovely way to spent an Easter weekend. Pictures below of our new neighbour, a Discovery 55, as well as pictures of the procession on Friday evening. 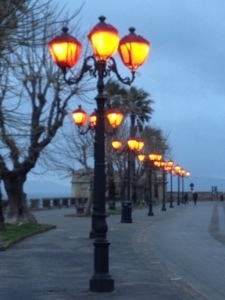 This entry was posted in News and tagged 2013, Equipment, Italy, Med, Sardinia. Bookmark the permalink. What an unforgettable experience!!!!! Happy Easter Y’all…. Glad you had a good Easter. We too did the procession on Friday but ours lasts 3hrs and my feet were killing me by the end.I go every year and love it but it is always exactly the same! !All the “penitents ” carry sweets in a large bag under their robes for the children The first year I went I thought they were all pregnant. Sad woman!!!!!! Glad you had a great Easter. Feels good to be getting our boats ready for the summer doesn’t it. 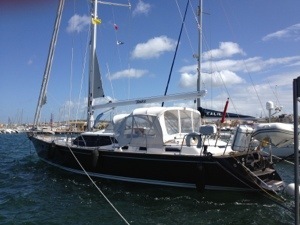 We are taking Moonshadow back to the Solent next week. Ah, Caron and the boat is Pinkfish. Small world, eh? If you’re going to be in the Solent, it would be great to meet up.